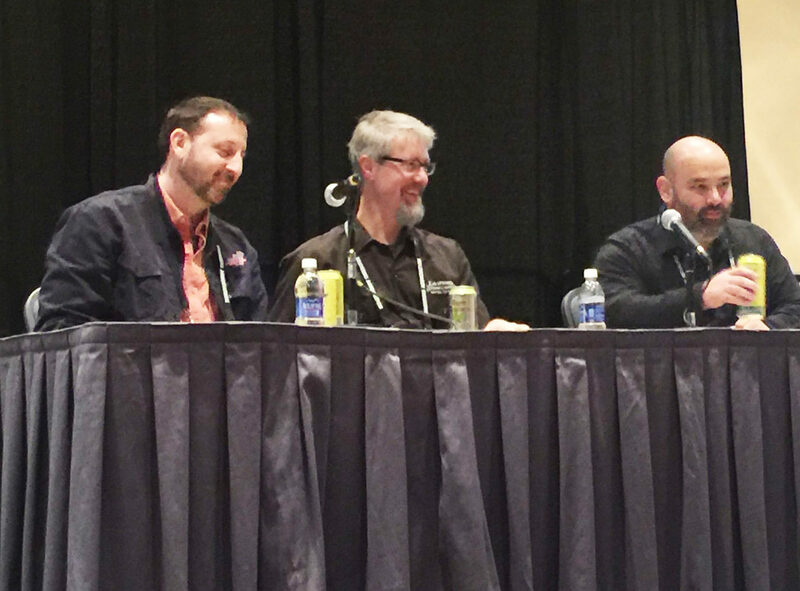 About 5 years ago at the craft brewing convention in San Francisco – Dogfish’s Sam Calgione said the craft brewing community was a “tribe”. Now, just those few years later, the craft brewers convention draws more than three times as many participants and the tribe has become a “race”, and many of the original craft breweries (Anchor Steam, Ballast Point, Firestone Walker, Elysian, Lagunitas, etc) have either sold out or sold part of their interests to others. But there are still great stories of collaboration, cooperation and brewers enjoying sharing experiences with each other, living the dream. This story starts for me in 2004 when I brought my craft beer class to the John Harvard’s brew pub in Wayne Pa. The brewer there, John Rehm, was kind enough to allow me to bring a class of 20 interested beer appreciators to see a “real brewery” back then when it was a lot more of a curiosity. During the tour, John showed off his 7 bbl copper brewhouse, and shared his experience making a diverse set of brews with that shiny set up. A few years later, John Harvard’s pulled the plug on most of their breweries much outside of Boston, and John moved on to Yards, then later to Philadelphia Brewing. Fast forward to 2011, and I find myself in San Antonio Texas, and while at a downtown brewpub (“Blue Star”) I was advised “if you really like beer, you have to head out to Freetail out on the loop highway”. Well, of course I really liked beer, and though somewhat daunted by the $50 cab ride, I eventually found myself at Freetail – a really cool brewpub with wildly inventive beers, including some new styles and a fun, edgy feeling. (Thinking a light touch of Three Floyds mixed with the homeyness of Ambler’s Forest and Main). While chatting with the bartender about BeerAppreciation in the Philly area, he remarked that his brewhouse equipment came from somewhere around there. I looked though the back – and I saw that familiar copper glint. And yes, there was John Rehm’s old brewhouse, still making inventive beer but now doing it outside of San Antonio. Fast forward to the 2016 craft brewers convention in Philly, and the planets finally aligned. 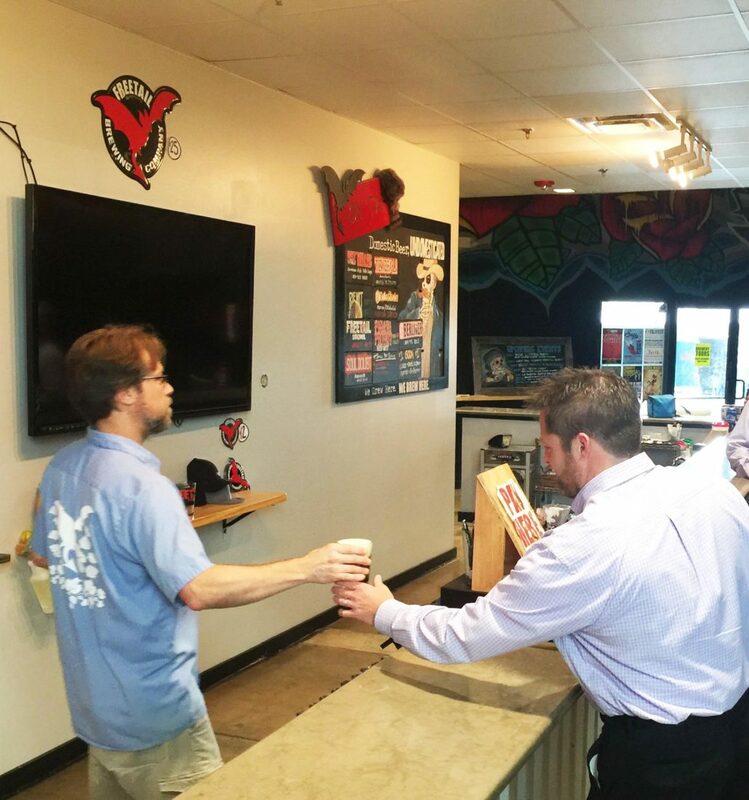 I saw Scott Metzler the owner of Freetail do a presentation on the costs of building a new brewery (along with the irrepressible Jeremy Cowan of Shmaltz and Nano turned Micro sensation Sean Lawson), which featured Scott’s story of buying the John Harvards system site unseen in 2008. “It cost me as much to move it to San Antonio as it did to buy it”. After the presentation I told him my story of enjoying the brewhouse in Wayne and San Antonio, and he invited me to visit his new 20 bbl brewhouse in downtown San Antonio the next time I was in town. Later that summer John Rehm, now the quality control brewer at the huge Connecticut brewery “Two Roads” came to Philadelphia for a Philly Beer week event in Fishtown. It was fun to catch up – he told me that Two Roads was a few blocks from his childhood home and his parents had told him that maybe he should see if they would hire him. That sure worked out well for both parties. 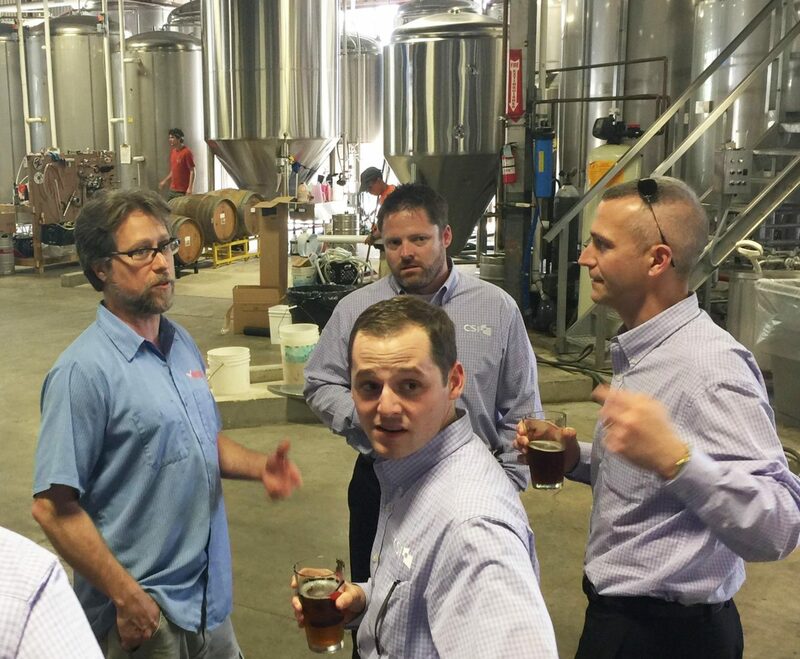 I shared the story of his brewhouse in Texas and he was delighted that it was still in use. Later I shared photos of the brewhouse in both locations with both Scott and John, and then introduced the two of them on email. How cool is that? 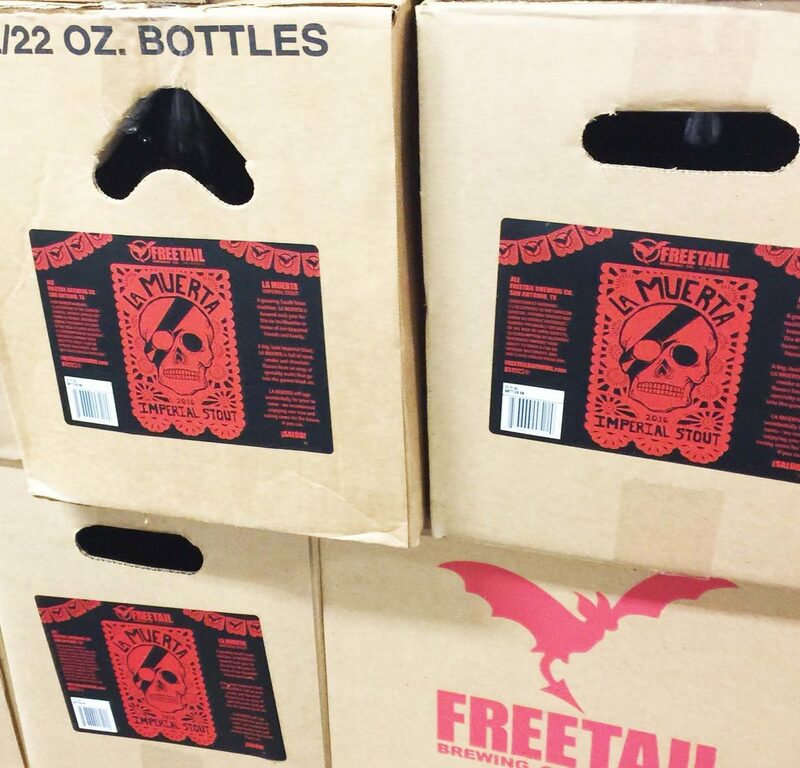 Freetail was about to release their day of the dead Imperial Stout “La Muerta” which has become a local cult favorite. Offered in multiple finishes, including bourbon and tequila barrels, each version features a label with a likeness of an entertainer that died this year. I found the 9.5% imperial stout surprisingly dry and deliciously drinkable, and was even able to identify who was on most of the labels. 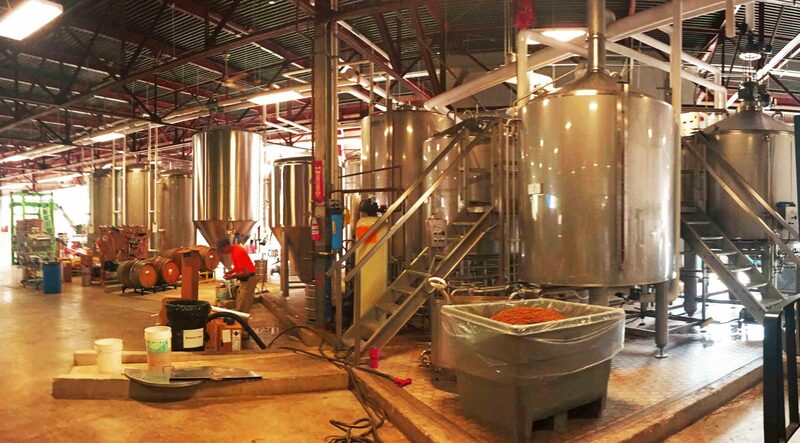 Their new facility (2 years old now) was established partially thanks to a change in Texas brewing law which enabled a brewery to sell up to 10,000 barrels from one licensed site. At 4,000 barrels this year, Freetail still has some room to grow – and their spacious warehouse brewery can accommodate growth. (Two new fermentors were still in plastic wrap when we toured the place in late October). I am looking forward to seeing John Rehm in the huge Two Roads facility, but somehow sipping great beer at the new Freetail location 11 years from my first John Harvard’s experience with Freetail’s old Pub brewhouse helped me come full circle. Good people making really good beer, wanting to share with each other, makes me quite happy to still be be part of the brewing tribe.